Law without Lawyers: does legal education have a future? In his recent UC Connect public lecture, Professor John Hopkinsexplained how the changing nature of law, the increasing cost of legal advice and the excessive formality of the legal system had left the way open for alternative ways to undertake ‘law jobs’, without the need of lawyers. “From Blockchain to ‘Alternative’ Dispute Resolution, the way appears open for a legal system without the need for high priests of the legal profession to navigate it,” Professor Hopkins says. Every year UC hosts a series of Careers Fairs to connect you with employers before you graduate. Kicking off the series is the Commerce Careers Fair and Law and Justice Recruitment Evening, Wednesday 7 March in the Undercroft. If you aren’t in your final year yet, Careers Fairs are for you too. Learn about internships, summer jobs and part-time work – it is never too early to start thinking about the direction you are going in and what your next steps might be. Come along and talk to employers, find out what they have to offer and what you can do to make yourself an attractive candidate after graduation – you might find there are simple things you can do now to make yourself an even more attractive graduate. Top tip 1: Don’t be guilty of narrow thinking. Did you know banks often recruit engineering graduates too? Careers Fairs are a great way to find out all your options and you never know you might find a different career opportunity you never thought of. Top tip 2: Put your best self forward at the fairs. Leave scruffy at the flat. A group of Pasifika students from UC’s School of Law recently attended the Pasifika Law and Culture Conference, hosted by Victoria University of Wellington. The annual event aims to increase understanding of Pacific legal issues and strengthen relationships between Pacific legal scholars and students. Law students from six universities went head to head in a mooting competition. One of UC’s two mooters, Anatea Prince, talks about the huge value of attending the conference – and their plans to keep the momentum going. The Pasifika Law and Culture Conference was an incredible opportunity for us to learn about Pacific legal issues and practice our legal skills through the mooting competition that was held. Perhaps the most valuable aspect however, was not the things that we learned, but the people we met. Before we left, we had never met each other before and we were all under the impression that we were the only Pasifika law students. Meeting each other and dozens of other Pasifika law students across New Zealand has been an amazing experience for us, so much so, that we wanted to bring that experience home with us. 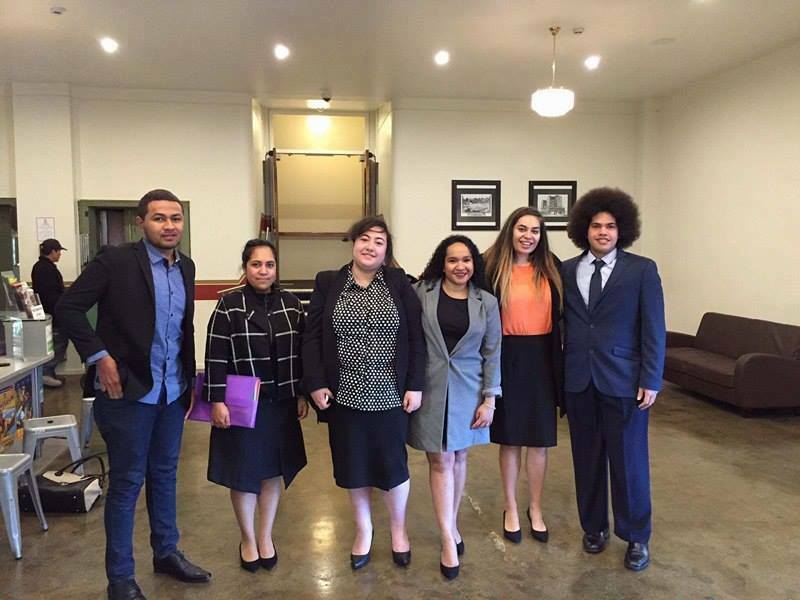 Photo: UC Law students Peniasi Apisai, Caroline Setefano, Anatea Prince, Raho Kila, Emma Ioane and Curtis Fatiaki. Looking around at the conference, we realised that we were one of the only universities that didn’t have a Pasifika Law Students’ Society and that those who did all seemed to know and support each other in a way that wasn’t familiar to us. So we came back, determined to make our own society which is currently being set up to hopefully be official and affiliated by the start of next year. Our society will be open to all students with a focus on Law students and also Criminal Justice students, but anyone interested in joining is welcome to. If you’d like to join or perhaps run for an executive role email me at amp123@uclive.ac.nz, and join our Facebook Page – UC Pasifika Law Students’ Association. We will be having our IGM soon.